Orlando restaurants wow with three-course dinners for only $33 in September! Visit Orlando Magical Dining Month is in full swing for a tenth year to the thrill of adventurous foodies across Central Florida. Through September 30th, Orlando visitors and locals can dine to their hearts’ content with magical three-course dinners at over 70 restaurants around The City Beautiful, including 8 recently opened. The special price of $33 per person includes choice of appetizer, entrée and dessert with $1 per meal donated to local charity Elevate Orlando, dedicated to supporting urban youth and helping them graduate with a plan for a bright future. That is magical indeed! The Orlando culinary scene has been abuzz with national media attention this year. It’s exciting for locals to see Orlando included in lists like The New York Times’ 52 Places to Go in the World in 2015 and Wine Enthusiast Magazine’s The 10 Best Wine Travel Destinations in 2015, however, their collective response is an emphatic “It’s about time!”. 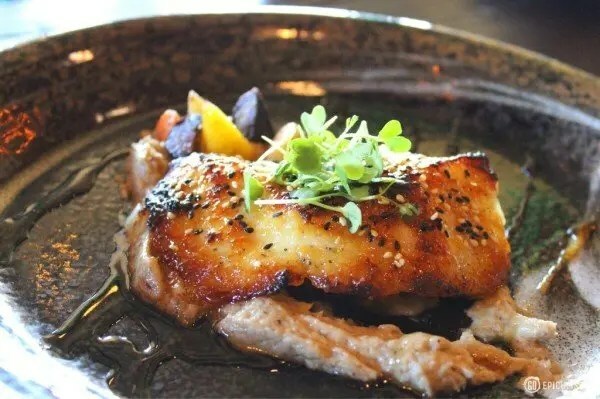 Media outlets are touting the rise of Orlando’s chef-driven restaurants and their farm to fork approach, as if these phenomenal restaurants all popped up out of nowhere in the past year. Orlandoans, who often use the hashtag #OrlandoDoesntSuck to highlight the many exciting things happening around town, know this is nothing new. Chefs like Kevin Fonzo from K Restaurant in College Park, Greg Richie of SoCo in Thornton Park, Kathleen Blake of The Rusty Spoon, and many others have impressed us for years, doing what they do best, quietly and without fanfare satisfying the appetites of diners looking for inventive food rooted in local comfort. 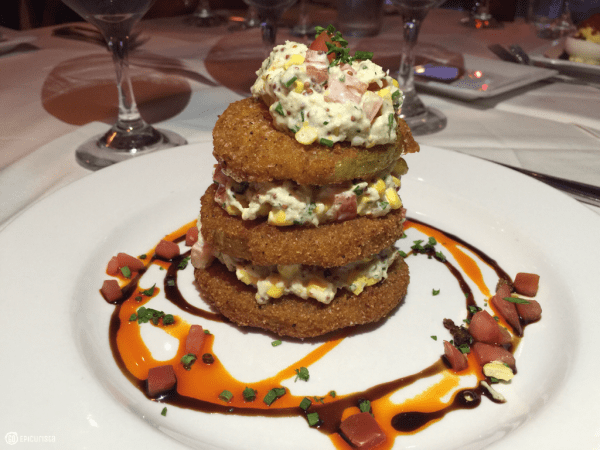 Take one bite of Fonzo’s fried green tomato with local corn and crab salad, Richie’s three-meat meatloaf with lobster mashed potatoes or any of Blake’s blackboard dishes of the day and you know why Orlando has been long overdue for the spotlight. It took some time for the national press to catch up and look beyond the magic glow of the theme parks to peek into what is happening in neighborhoods all around Orlando. That is truly where the magic can be found. Orlando Magical Dining Month is a great way to experience it! With no shortage of great restaurants to choose from, and so little time, how do you decide where to eat? The big question of Orlando foodies on social media right now is where to go for the best Magical Dining experience? These tips will hopefully help answer that question. 1. GO Try Something New. New restaurants and entertainment venues have been popping up all over Orlando this past year. Lucky for us, several have chosen to participate in Orlando Magical Dining Month. You can afford to be more adventurous when you’re spending less dough. These two restaurants are on my #MustEat list so GO make reservations! ^ Txokos Basque Kitchen features multi-year James Beard Award nominee Chef Henry Salgado’s homage to the flavors of Northern Spain at locavore favorite East End Market. Don’t miss the fabulous gin cocktails and the popular Pulpo Gallego. You’ve never tasted octopus like this! The three course menu was created especially for Magical Dining so it will only be available this month, giving even more reason to GO! ^ SoCo is Thornton Park’s newest neighborhood eatery where Chef Greg Richie wows you with Southern classics with a contemporary twist. Sit at their bar and enjoy fantastic whiskey cocktails like The Sparkler, a manly mimosa with Bernheim Wheat Whiskey, and don’t miss the Hawaiian inspired Pork Belly Biscuits with a killer jalapeno jam. 2. GO For The Classics. 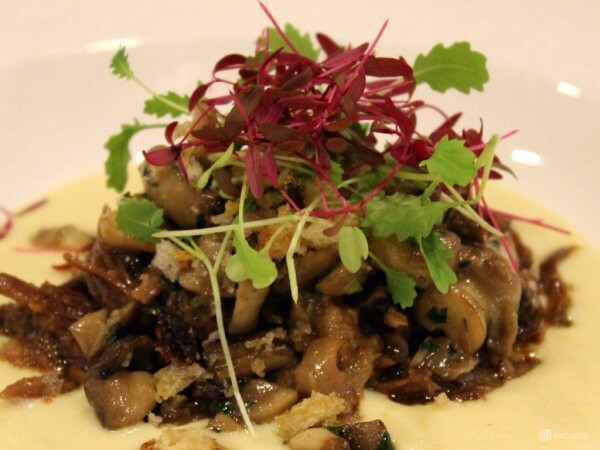 ^ Le Coq Au Vin, voted Orlando’s Best French restaurant, is serving their traditional French experience with classics Esargot, Beef Bourguignon and Crepe Suzette. 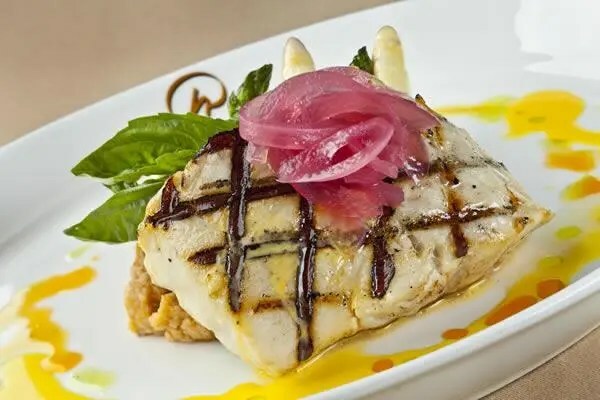 ^ Newcomer to Orlando Magical Dining this year, Christini’s, has been making diners swoon for decades with an elegant Italian feast and all the fine dining touches. The perfect spot for a classically romantic dinner of filet of sole, veal scallopine al marsala and ricotta cheesecake. 3. GO For The Choices. Conveniently review the Magical Dining Menus here and GO for restaurants with the most dishes to your liking. More is definitely better and some restaurants are doing it right by offering more than 2 choices per course. 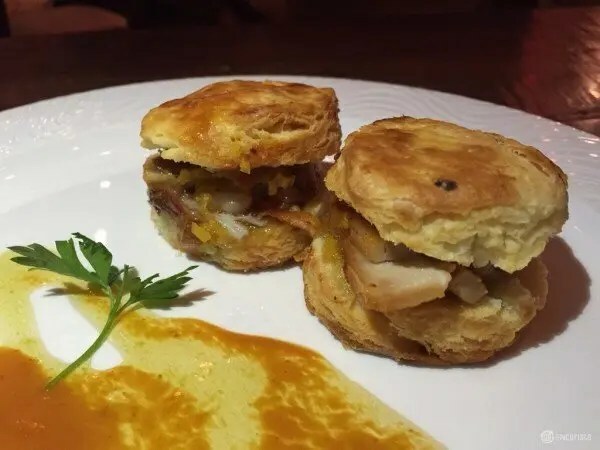 ^ At Cuba Libre Restaurant and Rum Bar, you get your choice of 8 different appetizers offering the full flavors of the Caribbean like Bruschetta de Tostones, a trio of fried plantain topped with grilled pineapple guacamole, Baja bay scallops ceviche and beef picadillo Cubano with dijon mojo. Then you get a bonus salad course, plus six choices of entrees like Arroz con Pollo and Lechon Asado and a rotating selection of desserts to top it all off. Sip on authentic mojitos, and you will feel like you hopped on a plane ride to the current destination of the moment. ^ Seasons 52, celebrates living well 52 weeks of the year, and this month’s Magical Dining menu gives you four courses instead of three by starting with a shared flatbread appetizer – the Blackened Steak and Blue Cheese flatbread is a big favorite! A salad course, choice of 5 entrees including Oak Grilled Filet Mignon, and for a sweet ending you get 2 of their famous mini desserts. They started the mini dessert trend and still do it best! The wine list also offers unique varietals and you have two locations to choose from, Dr. Phillips and Altamonte Springs. ^ For an unlimited amount of great food with over 60 items to choose from, Fogo de Chao Brazilian Steakhouse is your spot, where gauchos – lovely men wielding various grilled meats on a stick – come by your table non-stop to delight your carnivore side while the outrageous salad bar balances out the meal with starches and veggies. Dinner price is normally $48.50 not including dessert, so at $33 this is a great deal! ^ American Q at the B Resort is a BBQ-lovers dream, showcasing various barbeque styles from the Carolinas, Kansas City, Texas and Latin America, in an endless parade of meat. The sides and salad bar are displayed on the back of a classic red pick-up truck making it a fun place for the whole family. When offering prix fixe menus, some restaurants sadly miss the opportunity to showcase their creativity. Offering instead, safe options of soup or salad, beef, chicken or salmon and chocolate mousse. Incredibly boring, unless they kick it up a notch! Other restaurants GO for creativity in a big way. Look at the menus and reward those that do it right. ^ K Restaurant, my favorite neighborhood restaurant, if only I lived in College Park, is worth the drive no matter where you are. Chef Kevin Fonzo is one of the area’s top chefs and his ever-changing menu does not skimp on showing off the best this region has to offer. Start with Korean Beef Tar Tar with cured Lake Meadow Farm egg and I guarantee you will have an out-of-body experience with the tender Roasted Tri-Tip with bone marrow butter and crispy steak fries. End the night with any of Pastry Chef Michelle Hulbert’s fantastic desserts such as the Cinnabun Coffee Cake with house made salted caramel ice cream. ^ Emeril’s Tchoup Chop, where Emeril Lagasse and local celebrity chef Ryan Vargas know how to “kick it up a notch” offers an Asian-Polynesian fusion menu full of inventive choices. Start with creative, fun and flavorful dishes like Lobster cheesecake, Pulehu Rib Eye Steak “Alae” with garlic yucca steak fritas or Hawaiian style Saimin Noodle Bowl with braised oxtail and end with a chocolate PBJ Crunch Jar. ^ Chef Brandon McGlamery’s Luma on Park never disappoints and is still on my all-time Orlando favorites list. The menu changes regularly based on seasonal ingredients. Some samplings could include starting with Fois Gras Parfait with Rhubarb Gelee, moving on to Bratwurst Stuffed Chicken Thighs with marble potatoes and ending with at taste of Florida Key Lime Curd. The wine list, with half glass options, is also perfect for selecting pairings with each course. Plus, the people-watching on Park Avenue is the best in town. ^ Kathleen Blake’s The Rusty Spoon is a welcome addition to Orlando Magical Dining Month. You can’t get any more local and creative than her ever-changing blackboard menu including dishes like Lake Meadow Stuffed Eggs, Butter Poached Local Clams, and Canaveral Shrimp with local catch and littleneck clams in a rich shrimp-peanut broth. End with a nod to your childhood with grown-up s’mores given a healthy kick of booze. K Restaurant Roast Tri Tip with bone marrow butter and crispy steak fries, sinful choice! 5. GO For The MVP. ^ Eddie V’s, my go-to spot for posh dining on Restaurant Row, is not only a beautiful restaurant with gorgeous views of Sand Lake but they wow you from start to finish. 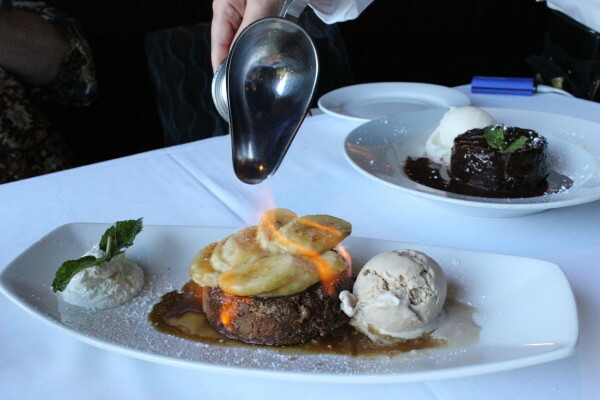 You can read my review here and definitely save room for their Bananas Foster Flambed table-side. Plus, don’t miss the live jazz in their V Lounge. ^ Del Frisco’s Double Eagle Steakhouse, is a newcomer to Orlando this year, yet their reputation for fine steaks precedes them. 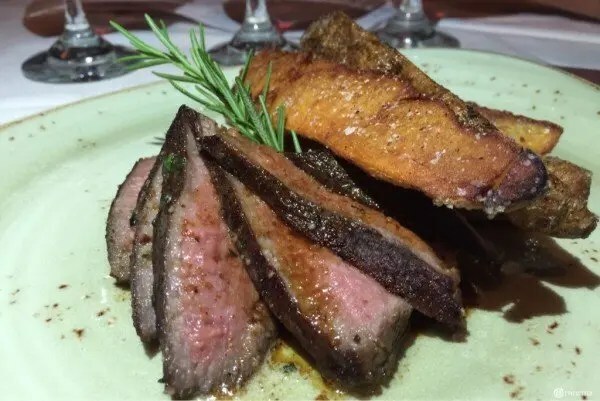 At the Orlando Magical Dining price, this is the place for classic American steakhouse dining of Caesar salad, filet medallions with chateau potatoes and decadent cheesecake, without the price tag. 5. GO Make A Night Of It. The Orlando Magical Dining program this year no longer includes the hotel and dining packages of years past, however, that does not mean you can’t make a package of your own. Area hotels usually offer special promotions during the month of September, traditionally one of the lowest occupancy months in the city. Why not make a night of it and get away for a mini vacation (or staycation)? ^ For a relaxing resort getaway where, in addition to a great dinner, you can indulge in spa services, lounging by the pool and a round of golf, check in at local favorite Rosen Shingle Creek Resort, and dine on Ahi Tuna and a fantastic 12oz Center Cut Rib Eye with Shrimp Scampi at A Land Remembered Steakhouse. ^ Enjoy a romantic weekend exploring the picturesque city of Winter Park with a stay at the upscale boutique hotel Alfond Inn and dine at Hamilton’s Kitchen, where Chef Marc Kusche brings you his farm to table experience sampling citrus cured salmon and slow braised short ribs. ^ Disney is always magical and The Four Seasons does it better than anyone else. Spend the night in posh accommodations and indulge in Italian specialties like beef carpaccio, Veal Milanese and sweet grape focaccia with Nutella gelato at Ravello. This is a gorgeous place to GO indulge. ^ In need of a girlfriend’s getaway? Take advantage of all the outlet malls shopping nearby International Drive and indulge in world-class spa services and relaxing poolside at Rosen Centre with dinner at Everglades Restaurant, noshing on Orlando Dining Hall of Fame Chef Fred Vlachos’ Macadamia-crusted scallops, Florida Grouper with smoked tomato grits and Key Lime Pie, or stay at The Hyatt Regency Orlando and dine on a Seafood lover’s feast of Maine Lobster, hearty Cioppino and Yellowtail Snapper at the new Urban Tide Restaurant. Magical Dining is a great opportunity to get friends together, celebrate life and create lasting memories over a fantastic meal. Plus, the more friends, the more you get to sample different dishes, as long as you’re all willing to share. Around my table it’s tradition to pass plates around. Sharing is caring! These are great spots to GO with friends as they not only have creative menus but inventive happy hour cocktails to get the party started. 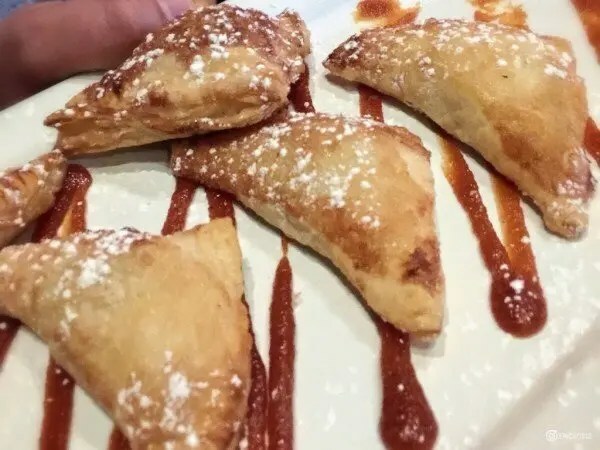 ^ Kasa Restaurant & Bar in Downtown Orlando not only has a fun menu of shisito peppers and pan seared gyoza, chimichurri hanger steak and matcha green tea panna cotta but they also offer themed nights and great happy hours to enjoy before dinner. You can read all about it in my review. ^ Dragonfly Robata Grill & Sushi has a bounty of creative choices on their menu plus their Omakase-style bar program is worthy of a visit. Let the bartender create a cocktail to suit your mood while you nosh on seafood sunomono salad, tender misoyaki black cod, artistic sushi rolls and seasonal housemade ice cream. Read all about dining at this local favorite in my review here. ^ Chef Scott Copeland showcases his artistic side at downtown Orlando’s Artisan’s Table with lamb meatballs, chicken fried ribs and Persian zucchini frittata. Don’t miss their all-day happy hour with ever changing infused cocktails. Here’s my review to tempt your taste buds. Restaurants are popular on weekends so I prefer to dine mid-week and have a more leisurely evening. Reservations are always recommended, regardless of when you choose to go and many offer online reservations. 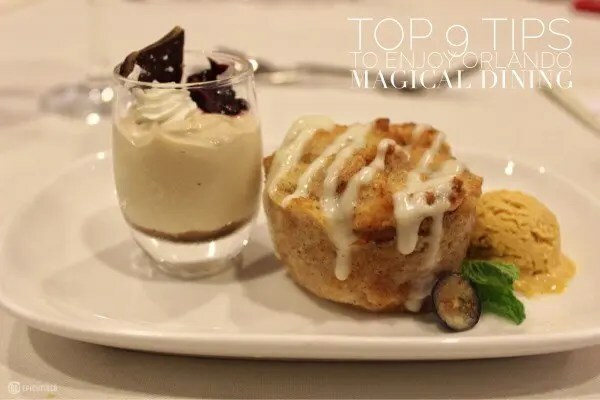 Also keep in mind, some restaurants will gladly present the Magical Dining menu when you are seated, and may even offer extra perks and bonuses for you to return. At other restaurants, you must specifically request it. 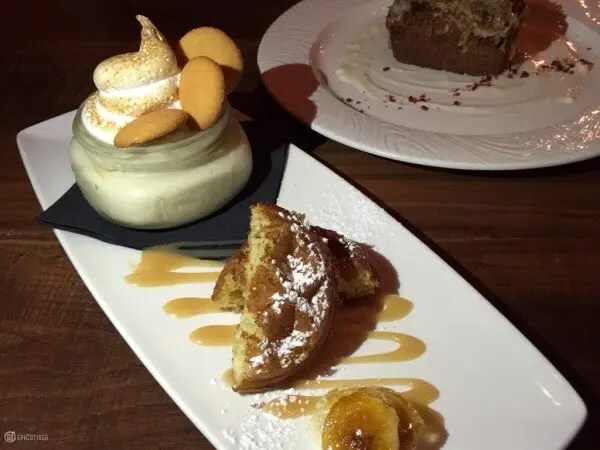 Don’t forget to make reservations for SoCo so you don’t miss this Banana Pudding! Looking for vegetarian dishes? Worried about food allergies? Is parking additional? Do they offer wine pairings? Call and just ask. Every restaurant participating in Magical Dining does so as an opportunity to gain new customers. Ask about any concerns or wants, and chances are they will accommodate. Most hotel restaurants will offer complimentary parking including valet. Every restaurant will accommodate vegetarian requests and food allergies, yet some do it better than others. Again, just call ahead, ask and then be the judge. One thing you don’t need to ask about is the prices for Magical Dining. It is always $33 per person and does not include tax and gratuity, so take good care of your servers. I hope you will GO take advantage of Visit Orlando Magical Dining Month. It’s not only a fantastic value and a fun opportunity to dine out with friends but it’s also a great way to support local businesses and dine for a good cause. Knowing your dining dollars will help Elevate Orlando’s mission to support local urban youth will definitely make dining out much more magical. Have you made your choices yet? Which restaurants will you be dining at for this Orlando Magical Dining Month? Please share in the comments below and don’t forget to share these tips with your friends using the social media buttons below. If you want more recommendations for Magical Dining Month including the best options for a fantastic date night, check out my article in Orlando Signature magazine right here. Just went to Urban Tide at Hyatt Regency last night! Had a wonderful time and got to meet the sous chef as well. How wonderful! That Cioppino is fantastic there. I must go back soon to have another bowl! Cheers!